The Big Red Machine dominated major league baseball in the 1970s, but the Cincinnati franchise began its climb to that pinnacle in 1961, when an unlikely collection of cast-offs and wannabes stunned the baseball world by winning the National League pennant. Led by revered manager Fred Hutchinson, the team featured rising stars like Frank Robinson, Jim O'Toole, and Vada Pinson, fading stars like Gus Bell and Wally Post, and a few castoffs who suddenly came into their own, like Gene Freese and 20-game-winner Joey Jay. 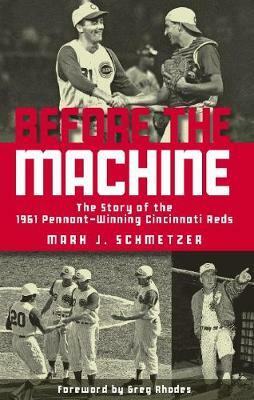 In time to celebrate the 50th anniversary of their pennant-winning season, the amazing story of the "Ragamuffin Reds" is told from start to finish in Before the Machine. Written by long-time Reds Report editor Mark J. Schmetzer and featuring dozens of photos by award-winning photographer Jerry Klumpe of the Cincinnati Post & Times Star, this book surely will be a winner with every fan in Reds country and coincides with an anniversary exhibit at the Cincinnati Reds Hall of Fame and Museum. Through interviews and research, Before the Machine captures the excitement of a pennant race for a team that had suffered losing seasons in 14 of the past 16 years. Schmetzer also beautifully evokes the time and place--a muggy Midwestern summer during which, as the new song of the season boasts, "the whole town's batty for that team in Cincinnati." Led by regional talk-show star Ruth Lyons (the Midwest's "Oprah") fans rallied around the Reds as never before. The year didn't begin well for the team. Budding superstar Frank Robinson was arrested right before spring training for carrying a concealed weapon, and long-time owner Powel Crosley Jr., died suddenly just days before the start of the season. Few experts--or fans--gave the Reds much of a chance at first place anyway. With powerhouse teams in Los Angeles, San Francisco, and Milwaukee, the National League pennant was unlikely to fly over Cincinnati's Crosley Field. But manager Hutchinson somehow galvanized his motley crew and led them to victory after victory. Joey Jay, who had languished with the Braves, mowed down hitters while his rotation mates O'Toole and knuckleballer Bob Purkey did the same. The team also featured a dynamic duo in the bullpen in Bill Henry and Jim Brosnan, whose book about the season, Pennant Race, became a national bestseller the following year. As the rest of the league kept waiting for the Reds to fade, Hutch's boys kept winning--and finally grabbed the pennant. Though they couldn't continue their magic in the World Series against the Yankees, the previously moribund Reds franchise did continue to their success throughout the decade, winning 98 games in 1962 and falling just short of another pennant in 1964. They established a recipe for success that would lead, a few years later, to the emergence of the Big Red Machine.